Block the sun, not the view with this new patented shutter. Combine the look of a traditional shutter with the modern technology of solar shade material is one of the more unique window treatments trends for 2014. This advanced design allows installation of a solar shutter in an area where you might not have been able to in the past for heat reduction, extra privacy, and glare reduction. Using solar material protects your investments from the heat and damaging UV rays which can be a major threat to your beautiful interior. Diffuse the light and maintain privacy even when your shutters are open with the removable solar screen attached to the rear of the shutter. Unique Feature: The screen is mounted with magnets, making it easy to attach or remove. Designed to compliment shutters in area where the sun’s rays were damaging to interior surroundings and to increase visibility while the louvers are in the open position. When louvers are closed the Solar Shutter™ minimizes the light that penetrates through the required margin tolerances. Reduce the sun’s heat, energy costs, and increase viewing quality of media devices with less interior glare. Using the 10% screen material, Solar Shutter comes in two color selections and the product is cut to fit behind any shutter panel. The fabric is welded top and bottom with a steel bar inserted into pockets for fabric rigidity. The magnets are placed in designated areas on the panels and the fabric is attached. This material is strong enough to endure the elements of the shutter panel usage, resistant to weather and easy to remove and clean. The latest in patented solar shutter material protects damage to shutters enhances the lifetime of your windows and improves energy efficiency. 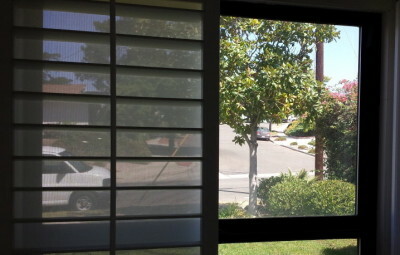 Installed in areas they would not normally be considered, the Solar Shutter also increases visibility in comparison to other shutter materials. Not Sure what Size Window Coverings you Need? 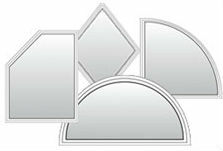 Download our FREE guide to window treatments for specialty shapes and sizes. Interested in the the Solar Shutter™, speak with one of our knowledgeable consultants at 3 Blind Mice Window Coverings to begin the installation. This is a good idea help can we have the same on wooden blind ??? And how can I get your automatic wooden blind with battery?? ?